For those of you reared on the gruff ‘Shostakovich sound’ of Kondrashin and others the refinement of Wigglesworth’s readings may come as something of a shock. Moreover, he takes a broader, more purposeful view of these scores than most, uncovering a wealth of hidden detail and sonorities along the way. This wouldn’t count for much if the results weren’t so compelling. For instance, I was quite sure the gaunt 8th wouldn’t survive Wigglesworth’s measured pace, only to discover that those great climaxes sound all the more powerful for being so doggedly pursued. In particular, the 12th which, like the 11th, is often considered a Cinderella symphony, emerges as a far better work than I had first imagined. Indeed, if anyone can be said to have rehabilitated that neglected work it must be Mark Wigglesworth. So, how does the 11th fare? As with all iconoclasts - and I’d say that’s a fair description of this conductor - first reactions are likely to be mixed. His tempi and phrasing in the first movement, ‘In the Palace Square’, are very deliberate indeed - just listen to those dark opening chords - yet the music retains a surprising degree of tension. And even though the recording is made at a fairly low level - as is the case with the others in this cycle - dynamic contrasts are very realistic and perfectly manageable. The hushed playing of the Netherlands Radio band is a case in point, every note easily heard, those muttered timp figures clearly articulated. The second movement, ‘The Ninth of January’, is similarly low-key to begin with, but Wigglesworth soon ratchets up the tension, restless brass baying above insistent drums. And despite the work’s obvious programme, Wigglesworth focuses more on the subtleties and nuances of the score, all of which are projected with striking clarity and implacable logic. That may translate into ‘too cool and detached’ for some, but aided and abetted by a warm, detailed recording Wigglesworth and his Dutch forces can be as ferocious as any when required. The snap of snare drums and those shattering bass drum strokes are superbly caught, the alarums and excursions of battle conveyed with forensic intensity. After that heat and turmoil Shostakovich strikes a note of utter desolation, the music leached of all warmth and drained of all momentum. Wigglesworth captures that chill as few others have done, ushering in the third movement, ‘In memoriam’, with the softest string playing imaginable. Indeed, the ear-pricking realism of this disc is a perfect complement to the conductor’s passion for detail; many of those barely audible string passages - a distant keening, perhaps - are often lost on less analytical recordings. Just as impressive is the amplitude and weight of the pounding theme that emerges at 7:57, less gritty than some yet no less powerful for that. And listen out for the spectral figure that flickers into life at 10:15; it may be short-lived, but in Wigglesworth’s hands it takes on a frisson all of its own. The last movement, ‘The Tocsin’, is apt to sound rhetorical at best and bombastic at worst, and it’s a measure of Wigglesworth’s skill that he manages to avoid both pitfalls. There’s plenty of thrust here, the playing as keenly focused as ever. One senses Wigglesworth has the measure of this potentially troublesome movement, each surge sensibly scaled and executed. And listen out for that titanic tam-tam smash at 8:34, the lingering reverberation of which are simply hair-raising. But it’s that juggernaut of a finale that draws together all the strengths of Wigglesworth’s vision, combining raw power with a remarkable degree of refinement, yet without sacrificing momentum or excitement. And that’s the nub of it; Wigglesworth’s musical judgment is impeccable, the results invariably illuminating. 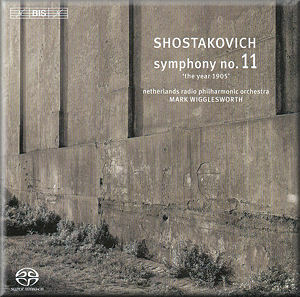 Yes, the young pretender Vasily Petrenko’s recent recording of the 11th might offer more ‘bang for your buck’, but if you want a deeply satisfying performance of this symphony - and an unrivalled recording - then Wigglesworth’s is the one for you.